Perhaps it’s fitting that Africa’s first 3-D printer should be made entirely from scrap: copper wire, the casing from an old computer, a PC’s power supply, and rails and tiny motors taken from broken bed scanners and photocopiers. In a region where informal markets prevail, and where so many manufactured goods appear for their second tour of duty (cars, shoes, computers), the W.Afate 3D-printer captures the driving ingenuity of many African economies: making things work, again. The W.Afate looks like a computer turned inside out—some sort of prop from Children of Men, or some other dystopian movie set in a post-apocalyptic future. But it was invented in Togo, in 2013. It started at the WoeLab, a bare bones tech incubator on the outskirts of Lomé, the Togolese capital. WoeLab—the group’s founder, Sénamé Koffi, calls Woelab Africa’s first space for “technological democracy”—imported a 3-D printer kit from France, and invited a handful of young people to take part in putting it together. 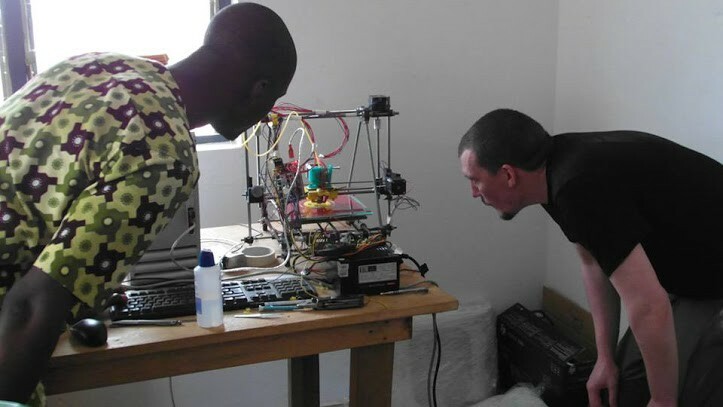 One of them, a geography student named Afate Gnikou, quickly saw (video in French) that 3-D printing in Lomé was unlikely to take off with a kit that costs $800, and he decided to build a 3-D printer out of e-waste, using only an arduino card to supplement the cheap recycled components that form the bulk of the machine. This kind of trash abounds in Togo today. In the words of Charles Schmidt, a science writer who has written extensively on the e-waste trade, “the electronics industry thrives on obsolescence,” and in recent years, e-waste, made up of computers, televisions, radios, and anything else with a circuit board, has become the fastest-growing waste stream on the planet. The UN estimates we produce between 20 and 50 million metric tons of e-waste every year. Very little of it is recycled almost anywhere in the world. 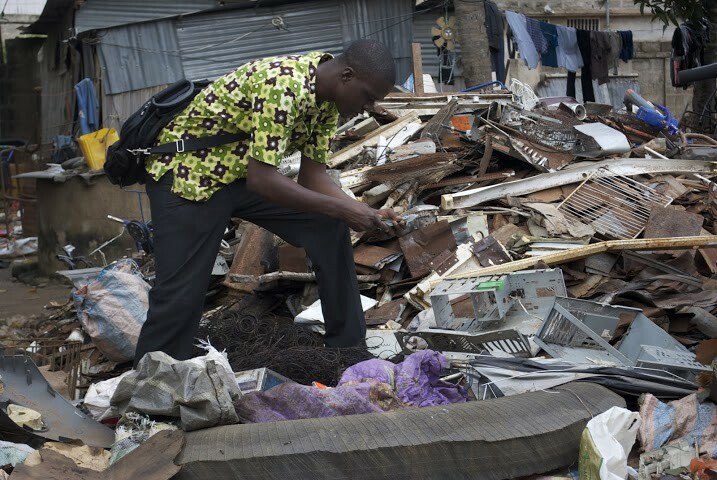 Most ends up in landfills and attics, in shipping containers bound for China (whose e-waste recycling industry processes an estimated 70% of the world’s discarded electronics) and, increasingly, in dumps in West Africa. Countries like Togo, Ghana, and Nigeria, end up disposing not only of their own e-waste, but of obsolete computers and televisions exported from Europe and the US. Where possible, vendors in African e-waste markets recuperate working components from scores of broken computers and re-assemble them into functional PCs. But in the main, informal e-waste recycling involves breaking electronics apart by hand and burning the circuitry to extract re-useable metals, a job often performed by teenagers and young children. It’s dirty, noxious work that involves intense exposure to heavy metals and other carcinogens, a disaster for e-waste workers’ health and that of the environment around them. Much of the e-waste trade already violates international agreements like the Basel Convention, and clearly, more ought to be done to mitigate the damage caused by electronics that have outlived their usefulness (the US, for one, could ratify the Basel Convention). The W.Afate printer hints at another model for reclaiming e-waste and reducing the harm it causes when it is burned and destroyed: the possibility that this ‘trash’ can not only be reassembled and made to work again, but that it can provide the parts for a new generation of useful machines.When the W.Afate prototype becomes operational in the coming months, the team at Woelab plans to use it to print soap molds for another NGO in Lomé, supporting other forms of small-scale manufacturing there. In an act of “tech solidarity” to expand access to 3-D printing in poor countries, they plan on distributing blueprints for the W.Afate design for free online. As for the e-waste that is polluting Togo in ever larger quantities, Woelab has another idea: send it to Mars along with several W.Afate printers, and allow the robots to use today’s garbage to print the machines of tomorrow.